Our group may have an unashamed love affair with honey bees, but we have come to realise they are part of so much more. They are, by dint of being generalists and by numbers, a really important pollinator insect, however they are not always the most effective for all plants. Bumble bees, solitary bees, hoverflies and moths are also important pollinators in decline. It is predicted that plant species diversity can be maintained until 70% of pollinator species are lost – provided the specialist pollinators are lost first. That’s a great deal to lose before there is a significant effect – and what happens if the generalist pollinators are then struck down by disease or similar? Catastrophe. In short, to achieve the best possible survival for humans we need to maintain biodiversity. This realisation has influenced our plants for bees project and saw us beginning the year by getting together to make bee and bug hotels. We made some for ladybirds and lacewings by cutting the base off a large plastic bottle (lid on to keep the rain out) and stuffing rolled and crinkled cardboard into lengthways to form small tubes, nooks and crannies. They then get hung vertically in the garden. For solitary bees we bundled together 15 or so canes of varying diameter cut to about 20cm’s long. Bees like them to be open at both ends. I think Honey Bees are my favourite drug. Better even than a Gin and Tonic. On this first truly warm day of the year, in a heady mix of sunshine and warm breeze there is a frenetic buzz of flying bees jostling to get their treasures into the hive. I find this satisfying enough, but the wonderful smell of warm propolis and honey transforms this into a pleasure I crave again and again. Add to that the faint adrenaline surge from realising I’ve put the wrong jacket on – the one that doesn’t do up very tightly and is too short, just inviting an exploratory bee to get stuck inside – and I’ve been grinning all afternoon. Soooo, when can I go and visit them again? I think I may just top it off with a G&T. After the recent cold spell it was a huge relief to see the bees flying today. There was an audible buzz as I approached the hive and I have to admit all thoughts of letting the children help me or use the stethoscope for practice quickly disappeared. The bees were bringing bright yet deep orange pollen in, which may be from snowdrops. Hefting the hive it felt quite light, so it was good timing to feed them some fondant candy. Heat until sugar dissolves then boil until thermometer reaches about 114 degrees C (soft ball), cool and then intermittently whisk with a handheld electric or hand whisk, it gradually turns opaque. Pour into containers just before it sets. All went well and I proudly took my offering to the bees, only to have a moment of self doubt about how to present it to them. I had originally assumed I would turn it upside-down over the hole in the crown board. But as I stood there images of bees getting swamped by a slowly slumping avalanche of white stickiness invaded my mind. I ended up placing it the right way up in the eke. I watched one intrepid bee sampling it from the surface and to my relief it didn’t get stuck or sucked in. In fact it flew off as I replaced the lid. I wonder if it will round-dance the location to it’s sisters in the hive? Save Bungay Library – what happens next..? The good news is that Bungay Library is secure for the next year and there is a great team working to ensure it stays that way for many years to come. The bad news is that the future reach and quality of the county-wide service remains uncertain. Suffolk County Council have incorporated an Industrial Provident Society (IPS) to run the library service independently; the hope appears to be that this new arms-length organisation will be able to run the libraries more cheaply, more efficiently and with less bureaucracy and more accountability than was possible when the service was run directly by the County Council. But Bungay is very lucky that Sylvia Knights, who campaigned so hard to save Bungay Library, has been co-opted onto the first Board of the new IPS – she’ll be joining a committed group from across Suffolk with a great breadth of experience running public and private sector organisations (including libraries). If it can be made to work they will make it work. Well done Sylvia, and thank you for putting in so much time and effort – it really is appreciated. Here in Bungay a cross-community library working group formed early last year, they’ve spent months developing plans that should ensure we have a library in Bungay for many years to come. Initially Suffolk County Council (SCC) had suggested that Bungay residents would have to find most if not all of the library running costs but by the end of 2011 (and after lots of active campaigning as well as quiet negotiating) SCC reduced the amount local communities would have to find to 5% of total running costs. This amounts to a around £1500 in the case of Bungay library – still a big chunk of money in difficult times, but a better position than we were in last February when it looked like the library would close for good. 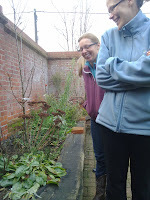 This is the second of our monthly (medicine) Plants for Life series of talks, walks and workshops in 2012, running in conjunction with the Plant Medicine Bed at Bungay Library. This month we’ll be in conversation with David Wrenn of Orchard End Organics – everything you ever wanted to know about growing and tending Organic herbs that we can fit into an hour’s conversation! Happy Mondays with the Community Kitchen is a celebration of the best local and seasonal ingredients. But it will also offer opportunities for volunteers to build their kitchen confidence, learn about local suppliers and discover new recipes and ideas. We cook for 40 or 50 people once a month, this time we’re serving pancakes filled with leeks and mushrooms in a creamy white wine sauce, three winter salads with rhubarb cobbler for pudding. Green Drinks will make a welcome return on Tuesday after a break over Christmas. It’ll will follow the usual relaxed format and we’re inviting expert conversationalists who can answer our questions about a specific subject, or steer our discussions along fruitful paths. Each year the central flowerbed at Bungay library community garden takes a different theme. 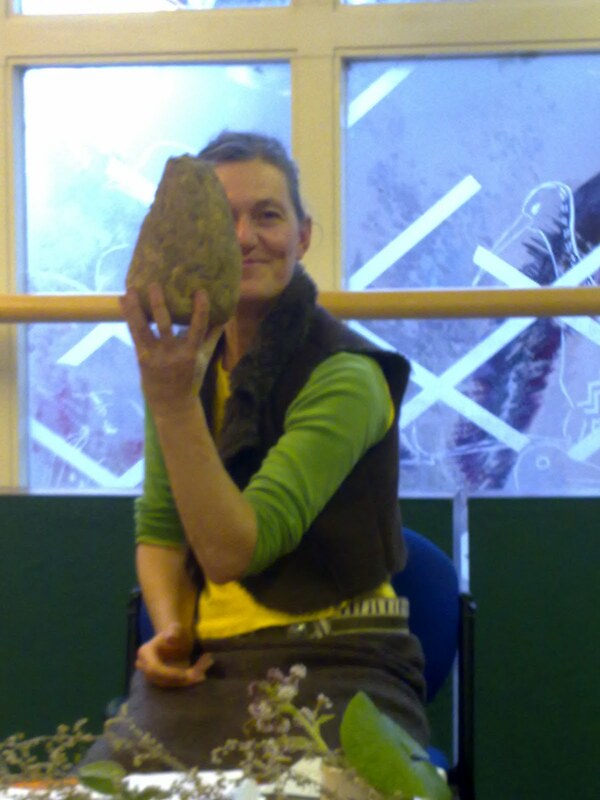 In 2011 it was Wild Plants for Bees and Butterflies, this year it will be Plants as Medicine. The intent behind the Plant Medicine Bed is to rekindle our relationship with the plants we share the earth with and to learn about making simple kitchen and garden remedies. As well as using plants physically to help maintain our health and wellbeing, having a relationship with flowers and trees is a tonic in itself. So in addition to the flowerbed as a display for all kinds of beneficial wild weeds and healing herbs, there will be a series of vibrant plants for life talks, walks, conversations and practical workshops with fellow ‘plant people’, taking place monthly throughout the year in the library and around the town. They will follow the seasons and are open to anyone who wants to deepen their connection with and knowledge of plants. 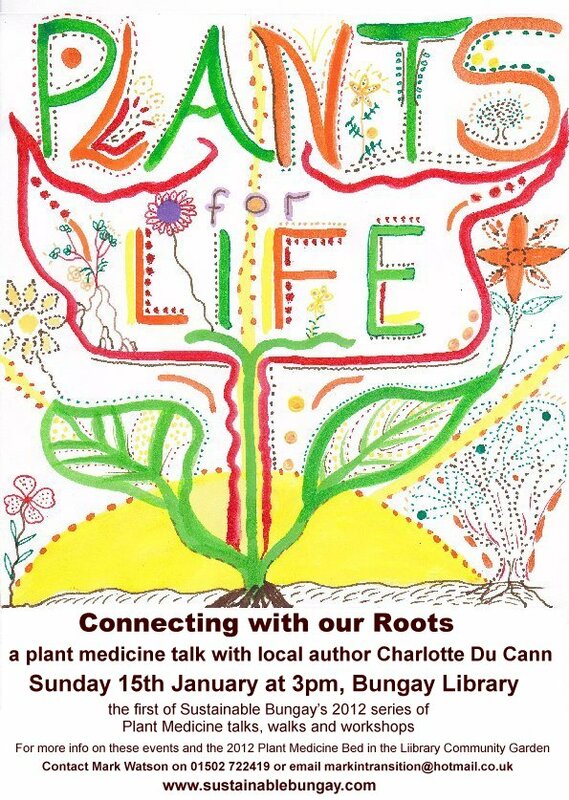 We start on 15 January with a creative look at Medicine Roots with SB’s Charlotte Du Cann (author of the forthcoming 52 Flowers That Shook My World). On 19 February, in conversation with David Wrenn of Orchard End Organics, we’ll focus on practical tips for planting and growing herbs. And on 18 March Medical herbalist, Dan Wheals (Transition Ipswich) will introduce Adopt a Herb (part of the Norfolk and Norwich festival), and show us how to find out about one chosen plant and explore the different stories that emerge. We look forward to seeing you there! Look out in the Spring and Summer for the Spring Tonic plant walk, making teas and tinctures and the Midsummer walk and wild plant oils workshop. For all enquiries contact Mark Watson: 01502 722419 or markintransition@hotmail.co.uk or check this website where I’ll be posting regular announcements and write-ups for both the plant medicine bed and the events. Bungay Library Community Garden was inspired by permaculture and transition principles and designed and constructed by members of SB’s library courtyard working party. It blossomed and burgeoned throughout 2011 thanks to the attention of many people, in particular Richard Vinton, who keeps a daily eye on the plants and trees (and the watering can, trowel and compost close by). Do pay us a visit during regular library times. The plants will love the company and you’re sure to love theirs!